All transactions are safe and secure with a reliable history in online purchasing behind each of our associates. 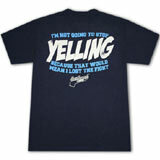 Buy the Not Going to Stop Yelling t-shirt to own Eastbound and Down clothing and merchandise. Is there anything that two brothers do better than fight with each other? This tee features a highlight from one of Kenny and Dustin's (John Hawkes) fights during which Kenny states, "I'm not going to stop yelling because that would mean I lost the fight." This navy blue Kenny Powers shirt not only features this memorable quote, it also displays the Eastbound and Down TV show logo. In addition to the Not Going to Stop Yelling tee above, browse the Eastbound and Down Clothing Gallery for more apparel like men's and women's clothes, kids shirts or hoodies.